Over a quarter of a century ago Lucas asked why capital didn’t flow from rich countries to poor countries. Simple economic theory suggests that poorer countries with less capital per worker should offer high prospective marginal returns to capital and so attract investment from richer countries, where capital levels have already reached high levels and the marginal returns are less. These flows should help incomes in poorer countries to catch-up. But Lucas showed that in fact these flows were very modest, and nowhere near the levels predicted by theory. In the decade and a half after Lucas’s work, global capital flows roughly tripled, prompting Prasad et al to revisit the ‘paradox’ in 2005. If anything they found it had intensified. 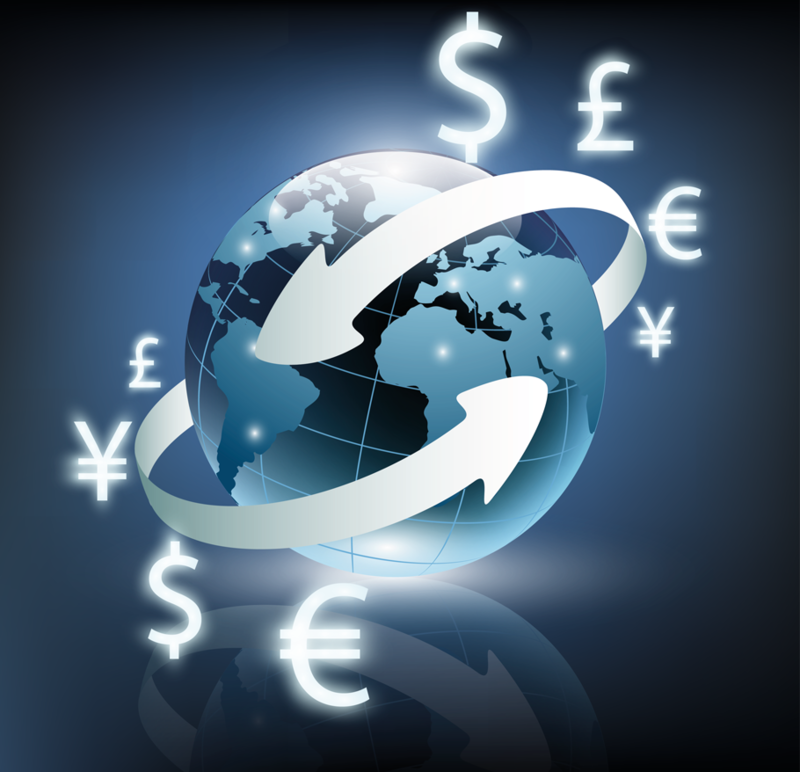 The overall amount of net capital flowing into or out of a country is represented by the current account balance, the difference between domestic saving and investment. If saving exceeds investment then a country runs a current account surplus and sends capital abroad. Chart 1 shows the average income of capital-exporting surplus countries fell well below that of capital-importing deficit countries during the first decade of the century. 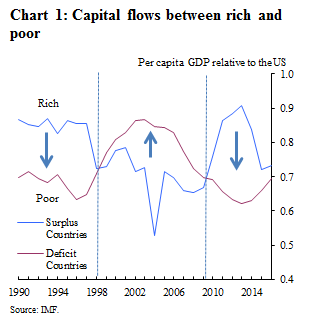 So while more capital was flowing around the globe it was flowing the wrong way, uphill from poor to rich countries! Indeed this perverse flow of capital was given a starring role by Bernanke in the story of global financial crisis. A lot has changed since then. Rolling Prasad et als’ chart on to the present shows there has been a reversion to the more logical pattern of richer countries lending to poorer countries. And this is confirmed by looking at the simple aggregates of advanced economies and emerging economies in Chart 2. But this aggregate picture is misleading because of a number of factors. First these overall flows include the behaviour of governments in building up or running down reserves, most notably China. Accumulating or spending reserves will likely be driven by factors other than differences in rates-of-return on capital. For example, countries accumulate reserves to protect themselves against financial crises, or influence the value of their exchange rates. Second, some large EMEs are commodity producers. With a non-renewable resource like oil, when times are good and the oil price is high it makes sense for them to save the windfall and run current account surpluses, building buffers of reserves for a rainy day. 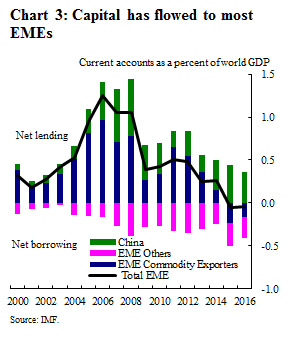 Chart 3 shows that in fact the period of EMEs running current account surpluses and lending to advanced economies, and its recent reversal, is wholly explained by the behaviour of China and commodity exporters. Other EMEs – 90% of the countries and shown in the mauve bars in Chart 3 – have in aggregate been persistently running a current account deficit overall, as we would expect, and so benefiting from net inflows of capital from advanced economies. For different motives, the accumulation by China and commodity producers of reserves invested in ‘safe’ advanced economy assets was behind the uphill flow of capital. This receded as China started to rebalance its economy toward domestic demand and so spent less on foreign reserves to hold the exchange rate down and promote exports. But more dramatically, EMEs sold reserves in 2015 and 2016 (Chart 4) – the yellow bars switching sign from outflows to inflows – to bring capital home. China had to sell foreign reserves to offset the impact of a sharp reversal in investor sentiment as credit risks in China mounted. And commodity exporters needed to sell off some of the ‘family silver’ to cushion the impact of lower commodity prices. Once we strip out changes in the official sector’s reserves we can see that through the ‘paradox’ period there were net flows of private capital to EMEs, in line with economic theory (blue line Chart 4). 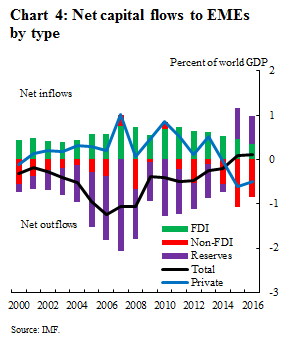 But what is also revealed is that these net private flows went sharply into reverse in 2015 and 2016 – pushed by heightened risk in China and pulled by the prospect of higher returns in advanced economies as QE is withdrawn. So during the ‘paradox’ period private capital was flowing in the ‘right’ direction, concealed by reserve accumulation. But just as overall flows resumed a more normal pattern, net private capital switched to the ‘wrong’ direction, masked by EMEs running down reserves buffers. The portfolio element of these flows have rebounded strongly so far in 2017 but could yet prove fickle in the face of a tightening in monetary policy in advanced economies. History suggests that portfolio and banking flows are prone to bubbles. More encouragingly, FDI inflows to EMEs (blue bars Chart 4) have been remarkably stable and are more likely to reflect relative rates of return on capital. Alfaro and Chauvin caution that the broad finding from the macro literature is that across countries, FDI is not unambiguously associated with GDP growth; sound local financial markets are an important precondition for benefits of FDI to materialize. But inflows of FDI do seem less likely to end in tears. 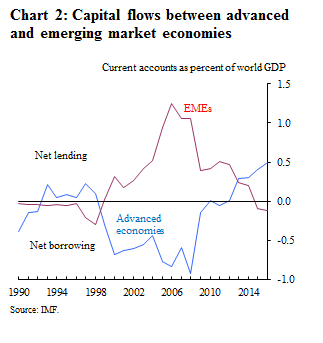 Is capital flowing to the right EMEs? Of the capital that does flow to EMEs, more should go to the countries that are growing the fastest and are therefore likely to have the best investment opportunities. But does it? Current account balances are a measure of total external financing available for investment in a country. Countries that borrow more from abroad, running larger current account deficits, should be able to invest more because they are less constrained by domestic saving and, therefore, can grow faster. Chart 5 smooths through booms and busts to look at the correlation between long-run averages (1990-2016) of growth and current accounts for 55 EMEs. Looking across a large sample of countries avoids a few large countries like China driving the story. If capital is flowing to growth opportunities, or facilitating faster growth, the correlation should be negative: faster growth should be associated with current account deficits. 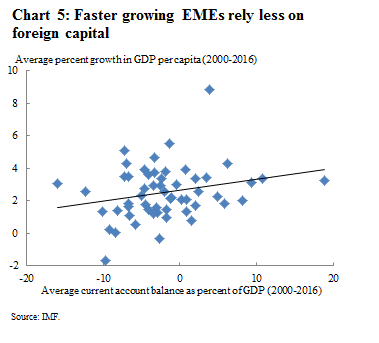 But the correlation is positive: faster growing EMEs seem to have relied less on foreign finance, running current account surpluses. 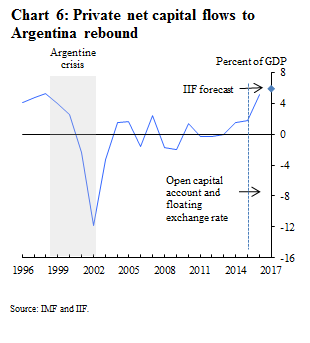 The IMF’s most recent External Sector Report also indicates that some EMEs could be making more use of foreign capital. Five of the 12 EMEs covered in the report are judged to have current accounts stronger (ie net external borrowing weaker) than warranted by fundamentals. The IMF prescribes exchange rate flexibility, strong institutions and well-functioning domestic financial markets to harness the benefits of capital inflows. Argentina, which takes over the Presidency of the G20 for 2018, has been a recent notable example of following this prescription. Fiscal and monetary frameworks have been made more credible, including setting an inflation target and giving the central bank more independence. And since removing capital controls and exchange rate restrictions and returning to international capital markets after more than a decade of isolation, the country has seen significant capital inflows (Chart 6). Almog Adir and Simon Whitaker work in the Bank’s Global Spillovers & Interconnections Division. Next Post Is the economy suffering from the crisis of attention? Taking financing (more) seriously” (https://www.bis.org/publ/work525.pdf). One of its main arguments is that analysis which focus only on net capital flow are inadequate for most purposes and if one focus on gross capital flows and its compositions the “Lucas Paradox” seams to be an illusion. As a young Economist I’am a bit disappointed that Boris Paper seems not the get the attention it deserves in discussions about upwards capital flows. I believe it would make a good add-on to your line of argument.